Carbon steel and stainless steel pan both of them are widely popular. Both of them have so many benefits as they are nonreactive, nonporous, lightweight, sturdy, and durable. Additionally, both types of pans are also the best choice for professional chefs. They are strong enough for heavy use. Besides all of these similarities, they have numerous differences also, which makes them different from one another. In this post, I’ve added a comparative discussion between Carbon Steel Vs Stainless Steel Pan including their pros and cons. Check below to know everything about carbon steel and stainless steel pan. Stainless steel is mainly a low carbon, iron-based steel which has several metals to raise its corrosion resistance and durability. Stainless steel always contains at least 10% of chromium metal. Other metals can add aluminum, nickel, silicone, and copper. 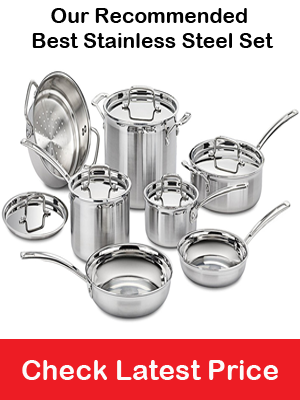 The composition of metals determines the level or grade of stainless steel pans. However, stainless steel has poor heat conductivity so the pans are usually made with an aluminum or copper core. A layer of aluminum or copper sandwiched between the stainless steel to increase the pan’s heat conductivity. Stainless steel pans are strong, most durable and also come with a lifetime warranty. Moreover, they are stable for versatile uses. High-quality and timeless classical cooking product. Stainless steel pan is safe to use in the oven. Stainless steel pan doesn’t need to be seasoned always. Doesn’t provide non-stick properties as ceramic or hard anodized. Can leach metal to food if it’s scratched or damaged. Not a good heat conductor. Heavy to lift when it comes with a copper core. Higher grade stainless steel pan can be expensive. Carbon steel is a combination of iron and a very small amount of carbon. It is usually heavier than stainless steel. Carbon steel pans come with natural non-stick properties that are free from the harmful toxin. It needs to be seasoned and get better with age. Moreover, carbon steel contacts with heat evenly and can tolerate high heat temperature. Like stainless steel pans, carbon steel pans are also durable and resistant to rust or corrosion. Additionally, carbon steel cookware leaches iron into the food that can be a great benefit for our health. As you know, iron is a healthy mineral that our body needs. However, carbon steel pans should never be seated in water or put in the dishwasher. As the detergent or dishwasher could damage its natural non-stick coating. Carbon steel pan can be put in the oven at the high heat temperature. It can be made non-stick if you can season it correctly. Can be last longer if cared for properly. Affordable as well as inexpensive. Carbon steel pans need regular seasoning. Can build rust if not properly maintained or seasoned. Not safe for cleaning with the dishwasher. Highly acidic foods could break down the natural non-stick seasoning. Stainless steel and carbon steel pans have various significant differences between them. There is a short list of the differences between carbon steel and stainless steel pans. Check it out to get more idea about them. One of the most obvious differences between stainless steel and carbon steel pans is the ability to resist corrosion. Both stainless steel and carbon steel comprise iron which oxidizes when exposed to the environment, creating rust. The added of chromium metal in stainless steel makes it more resistant to corrosion than the carbon steel. The chromium can attach itself to oxygen more easily than iron. When the chromium combined to the oxygen, it creates a chromium layer which protects the residual of the material from corrosion. On the other hand, carbon steel doesn’t usually have enough chromium to make this chromium layer. As a result, carbon steel allows oxygen to attach with the iron which results in iron oxide, or rust. So, if rust or corrosion resistant ability is the main factor, the stainless steel pan is the way to go. Stainless steel is best known as a poor heat conductor. For this reason, an aluminum or copper layer has been added on the base of the pans of stainless steel. The aluminum layer makes the stainless steel pans able to contact with heat evenly. On the other hand, carbon steel pans have great heat conductivity. They can retain heat for a few minutes after removing them from the heat. Although both of them can tolerate high heat temperature, still carbon steel pan can tolerate heat more than stainless steel. Between Stainless steel and carbon steel pan, both of them has a bright and shiny outlook. But carbon steel pans require a clear coat rather quickly after the polishing process. If this process is not applied, the carbon steel pan will start to tarnish and eventually rust. On the other hand, if stainless steel pan is scratched it will keep its shine in the affected area, while carbon steel pan would need to be repainted or it will be subject to corrosion. When it is about the cost, stainless steel pans are more expensive than the carbon steel ones. This is because of the addition of various types of materials in stainless steel pans including chromium, nickel, aluminum, and others. These additional materials all add up to an improved cost over carbon steels. In conclusion, now you know almost everything about Carbon Steel Vs Stainless Steel Pan. Both of them have so many features to offer to users. Both of the types of pans especially stainless steel pan require low maintenance and care. If you need a pan that will be strong and last longer, stainless steel will be a great option for you. Or if you want something inexpensive that will fix with your budget you can go with carbon steel pan.